To be honest there is plenty of information that you can find about how to photograph tomorrow’s meteor shower out on the inter webs. People have been asking about which setting they should use so here is a post by Ken Rockwell with some setting for photographing the Milky Way. In order to photograph the Milky Way you need to find a place what has little or no light pollution. A search will turn up several sites with maps showing where you might go to have far less light pollution than I have here at our house. Tomorrow night I will be out in the yard hoping to catch a few shooting stars and this is what I am going to try. This is looking north in our yard the exposure for this one was 3 minutes, f5.0, ISO 100 (this is from a Point and Shoot by the way). I’m going for star trails and some shooting stars. 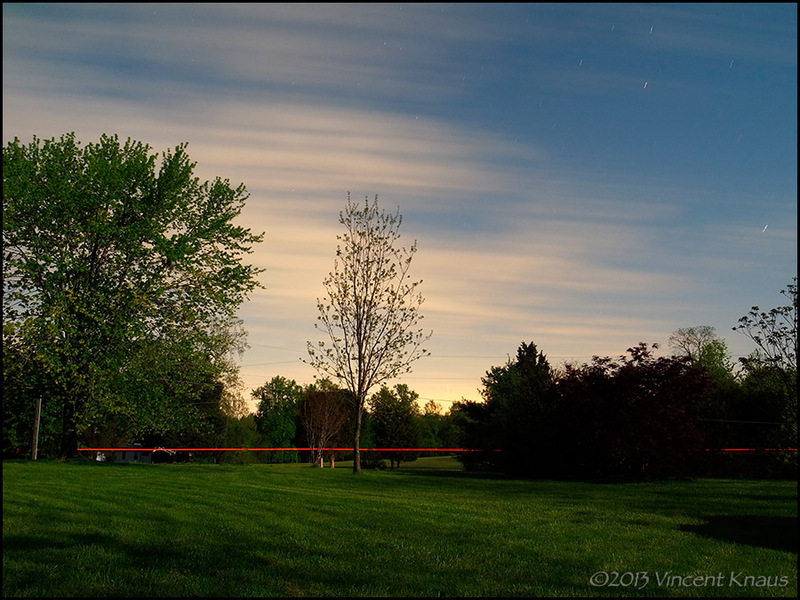 A long exposure and widish aperture should be enough to allow the streaking meteors to burn a path through my images in the same way lights on an airplane burn a path through the night sky. Yes, there was a full moon on the night I made this images but tomorrow afternoon the moon will set at 3:15 p.m. and not rise again until 3:16 a.m. Saturday morning. If the night is very clear, which is predicted, there won’t be any clouds like the ones you see in this image. I’m looking forward to seeing what I get. I will be playing around with the exposure and I might have more than one camera going. At least one of them will be a Point and Shoot. I’m not too worried about the light pollution because I know we live in an area where I have no control over that. I will be in my yard, having fun, doing what I love, making images.